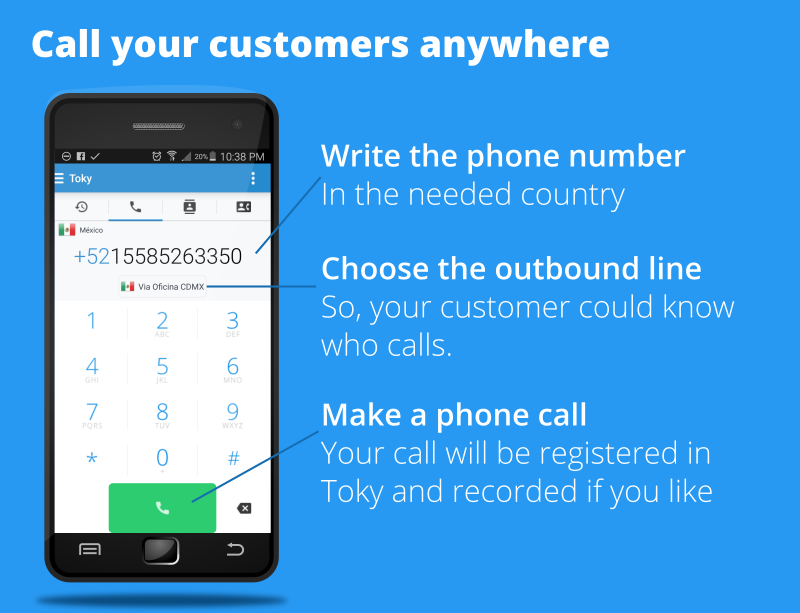 With Toky, you can make calls to any city of the world and at a very low cost per minute. When you have credit in your Toky account you can make calls using different alternatives in our platform. When you enter the Toky Dashboard, you can click on the Call Phone button to display the dial pad and you only have to enter the number in international format. After installing our Google Chrome extension, you will be able to make and receive calls without being in Toky's Dashboard. Just click on the dial pad button and start calling anywhere. Download Toky's appy and make international calls with Toky from your mobile device. After installing our Toky's Click to call Chrome extension you can call anywhere without leaving your CRM or applications like Google Contacts, Zendesk and others.